Brothers don’t necessarily have to be only saviours and zealous and jealous protectors to their sisters. They are of use in more ways, fun ways at that. For instance, brothers can be partners in crimes such as buying lollies and other goodies mother has forbidden with scant and scarce pocket money, shooting holes in the neighbour’s washing while aiming for fruit from their trees with an air rifle, stealing alu bondas for us girl cousins from the caterers of a wedding reception. We made perfect alibis for each other, at least the unspoken pact said so. Since boys had better access to certain utilities and facilities, such as transport (read bicycles) and extended or practically no curfew time, they were very handy for running errands. They were also useful for ordering goodies from the college canteen in the coed college we went to. Brothers came in handy especially for buying stuff from the ubiquitous Irani restaurants (known as Irani hotels!) in Hyderabad. Girls did not enter the Irani restaurants, as they still followed the ‘zanana’ system in those days. Our knowledge of these restaurants then was vicariously obtained from sneak peaks (over the scores of bicycles parked in the front and avoiding the rude stares of people thronging the inevitable pan shops) while passing by and through the description of the ambience by our brothers and uncles. My brother was often sent to buy the incredible sweet and savoury stuff indigenous to Irani hotels. I have once mentioned how he was sent to buy our first chewing gum from Café Casino or Café Galaxy or some such grandiose place. Bun- maska was an excruciatingly sweet and soft roll with a sugar and butter (they say it was margarine) spread. The wide mouthed large glass jars had stacks of the fat sweet and slightly salty Osmania Biskit and Chand Biskit a crecent shaped nan-khatai like sweet cookie. Afghan crim roll was a puff pastry cornet filled with pink and white butter cream. Equally awesome were the rows and rows of most perfectly uniformly hand iced little canapés. They were called pastries- a term I had to carefully dissociate with this only meaning I had learnt of the word as and when I knew better. It was a marvel how those patissiers never missed a swirl, nor messed a blob! The famous Irani chai – thick, milky, too sweet - was not so difficult to lay our hands on. Long nights of drama rehearsals and college events practice sessions gave us our fill of the ambrosial liquid. Legend has it that the secret trick was to boil poppy pods with the tea leaves. No wonder the broth was so addictive. But more addictive were the little samosas, vegetarian ones for us, thank you. The delicious, crisp onion samosas could never be bought, leave alone be eaten, in singles or pairs. One needed to buy at least four or five per person, and then again, we would gobble our share up quickly and dig into the communal paper packet very guilelessly as if we weren’t counting. I had only heard of Irani restaurants in Mumbai and Pune selling this little sinful snack and had promptly put it onto the list of things I would miss when I left India and my maternal home. However, I was pleasantly surprised to find them as ‘samboosa’ everywhere in the Middle East. This time the samosa was more accessible in the Malabari chai shanties. There were no restrictions and we ate them with abandon. But one could never have one’s fill of the samosas. Years later and across several continents, the samosa still bears the standard in our nostalgia parade, yet the triangles remained as unattainable and as mysterious as the Bermuda one. And so, when my brother mentioned them so very longingly the other day, I had to research, investigate and source the ingredients to make the Irani Samosas for him on his special day, Bhaubeej, or our Indian Brothers’ Day! Mix the chopped onion, poha, all the spice powders and salt well. Set aside for a few minutes while you prepare the paste and separate the sheets. Take one strip and place a tsp of the mixture on it at one end of the strip and fold one corner in dog-earing action. Make sure the triangular flap covers the filling. Then holding the folded side carefully, flip over the pointed edge to form another triangle. Repeat this till you reach the end of the strip. Within two turns, the stuffing should get sealed and remaining folds should just go on reinforcing the triangle shape. As you reach the end of the strip, apply some of the paste like a glue and stick the loose end to the triangle. Place the folded samosa with its last fold down so it holds better. Make all the samosas and then deep fry them in medium hot oil. 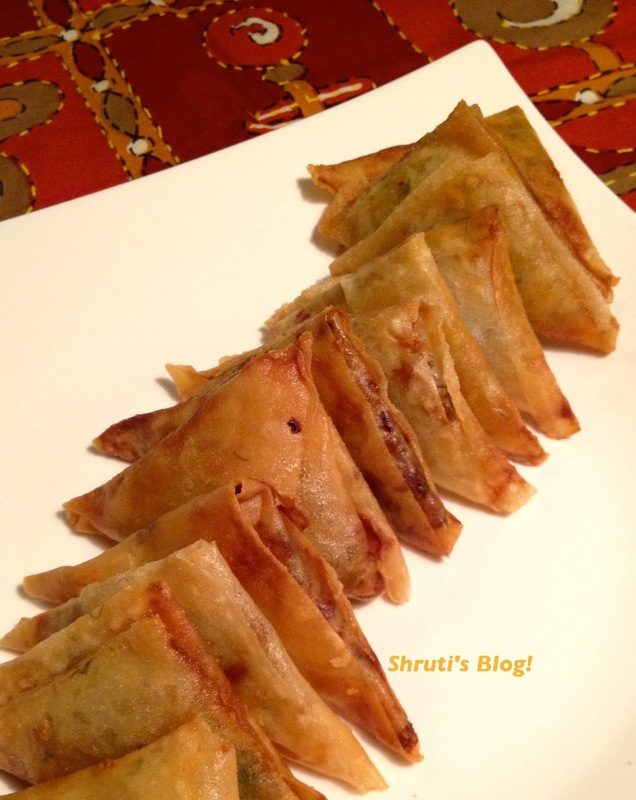 Irani samosas don’t need any chutney or dip.